We offer double, triple & quadruple rooms with private bathrooms, central hot water, continental breakfast, living room, baggage lockers, etc. 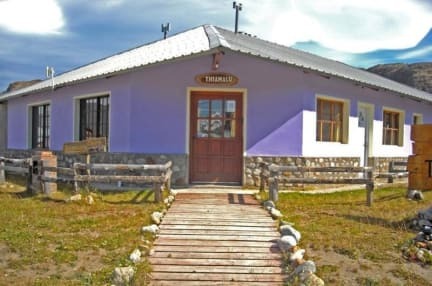 The tourist town 'El Chalten' founded in 1985, is located in the department Lago Argentino, in the southwest of Santa Cruz province. Is the youngest town in the country. 'El Chalten' is the name given to the mountain by the Tehuelches, the native inhabitants of the region. This mountain was later named 'Cerro Fitz Roy', by explorer Francisco Pascacio Moreno. Central hostel close to everything in town. Great shower with excellent water pressure and hot water. Very clean and homey. Breakfast was the best we've had in South America! Plus the owner Alé was so kind, accommodating and lovely! 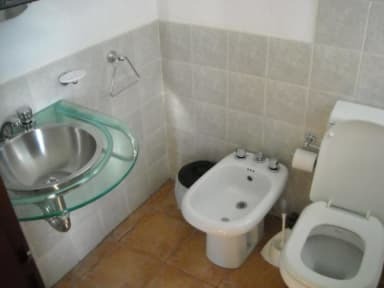 Comfortable bed, clean bathroom, excellent shower. Delicious breakfast. We got most of our information about hikes from visitor centre when we reached El Chalten, so didn’t enquire too much here. They also let us leave our bags while we went on a day hike after checking out. Overall positive stay. We had a lovely stay at Thiamalu guest house. The rooms are nice (first time we had a queen bed to share in South America) and the shower is fantastic, which is helpful after a long day of trekking. The hostess is very friendly and speaks some English. The breakfast is amazing: eggs, toast, croissants, yogurt, coffee, fruit, juice, the works! Overall I recommend this place. Very simple rooms, but spectacularly clean. A little further away from most restaurants and bars than other hostels in the area but the whole town is walkable. The host was incredible accommodating. She printed bus tickets for us and prepared us a breakfast the night before we had an early bus. The breakfast itself is delicious and plentiful. Definitely a more low-key lodging option but was suitable for our time in El Chalten. Great host, went above and beyond to make our stay comfortable. Yummy breakfast.. quiet.. quaint! Excellent hostel for couples, maybe less so for single travellers as there wasn't much atmosphere. The rooms are beautiful (as good as a hotel in the area) with great showers and good breakfast. Very close to the start of the Cerro Torre hike. 5 minute walk to the start of the main 'strip' - that's quite far in El Chalten!! A nice place to crash with a hot shower after a long day of hiking! The host is very nice as well! Nice enough place to stay and walk to trail heads and the main part of town and the bus station. No real kitchen or hang out space - if you are looking for something social. Amazing breakfast!